Facebook Inc. has been forced to take an intense look at its information-sharing practices in recent months. That doesn't mean the social media giant wasn't already aware and pro-active, however, regarding the need for enhanced security in our digitally driven age. To strengthen the worldwide firewall against cyber crime, Facebook has turned to higher education. The Facebook Info Security Program debuted in 2016 and currently sanctions only eight college and university computer science programs across the U.S. to teach a hands-on cybersecurity training class developed for industry insiders by the cyber-savvy organization CodePath. The program was designed in part to fill a dire and growing need for educated cybersecurity professionals. A special topics course on creating new kinds of code to defeat hackers was added in January to the SAU Computer Information Science (CIS) Department's Computer and Network Security degree program. In addition to St. Ambrose, foundational partners in Facebook's Info Security Program include Mississippi State University, Virginia Tech University, the University of Virginia, the City College of New York, Hofstra University, Merritt College and California State University-San Bernardino. Beyond invaluable professional training, the Facebook Info Security Program provides students at each school the opportunity to participate in all-expense paid trips to several of the biggest cyber conferences involving many of the world's largest digital corporations. More significantly, students who excel in the CodePath course can earn front-of-the-line access to internships with Facebook itself. Talk about a big thumbs up for one of SAU's most-poised-to-grow programs. SAU was asked to join the program after Stephanie Siteman, Facebook's diversity and academia outreach manager, represented the company at the CornCon IV Cybersecurity Conference on campus this past fall. 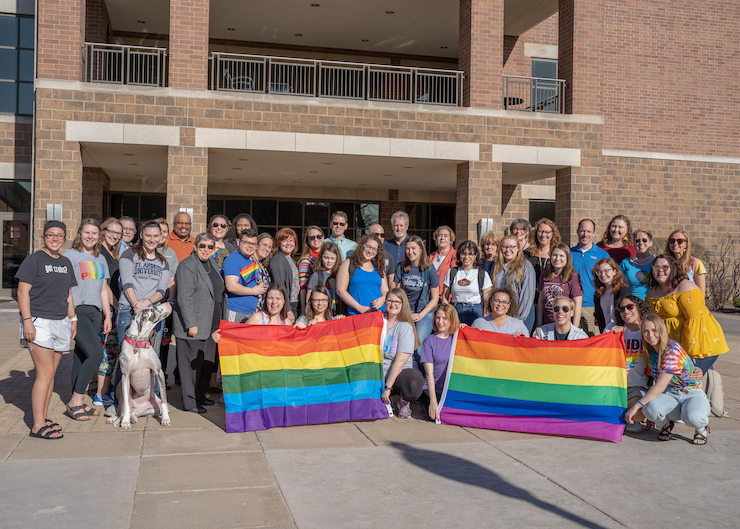 Siteman was so impressed with the CIS department's faculty and curriculum, she quickly offered to include St. Ambrose as an Info Security Program partner. "I was looking for a Midwest presence," she said. "Now, we're invested in St. Ambrose." In January, five St. Ambrose students attended the Enigma 2018 Conference in Santa Clara, California. They were accompanied by Sayonnha Mandal, PhD, the assistant professor who is teaching the SAU special topics course. Along with Facebook, the primary sponsors of the two-day conference included digital industry giants Google, Netflix and Dropbox. "It was awesome to see the wide array of research and eye-opening things in the industry," said Vincent Beckman, a senior computer science major. "And it was a huge opportunity to rub elbows with people in the industry, as well as vendors and job recruiters. It was interesting to get their take on what the industry is looking for." The students also spent a morning visiting Facebook headquarters in Menlo Park, California. "The people from their security team actually sat down with the students to talk," said Mandal. "That's a big opportunity." Angelique Iradukunda, an SAU junior from the small African nation of Rwanda, is a perfect example of the diversity-both gender and ethnic-Siteman said the Info Security Program hopes to foster in the cybersecurity field. While standing in Facebook HQ, Iradukunda couldn't help but wonder what her old Facebook friends back home might think to see her rubbing shoulders with the famed social network's inventors and primary protectors. "I would say that was a miracle," said Iradukunda, who also joined Mandal for a Facebook-funded trip to Chicago for a March conference on women in cybersecurity. "The first thing that came to my mind was ‘anything is possible.'" The Facebook stamp of approval only serves to illustrate the increasing impact of the computer sciences at St. Ambrose. "Facebook selected eight universities that it thinks have the faculty and facilities capable of serving this initiative-and that also bring an established commitment to teaching cybersecurity," said Kevin Lillis, PhD, a professor of computer science and the CIS department chair. "This doesn't just set us apart. It recognizes that we were already set apart. "We have had a cybersecurity program here for the past 15 years. That's light years ahead of other universities." 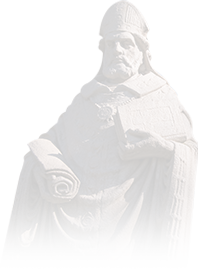 St. Ambrose has offered degrees in the computer sciences for 30 years. 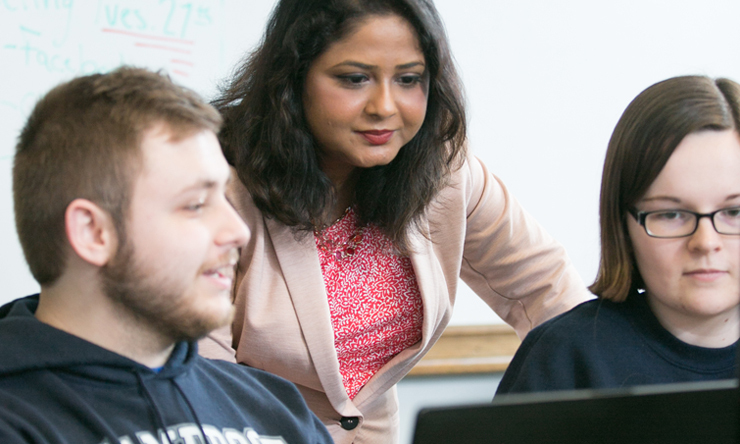 In addition to Computer and Network Security, SAU students can major in Computer Science, which focuses on programming and software creation, as well as Computer Network Administration, which prepares students to work as network and systems administrators. At the graduate level, a Master of Science in Information Technology Management degree helps IT professionals hone their professional management skills. Kevin Sinclair, a one-time film school student from Boston, began his pursuit of a St. Ambrose degree with a focus on programming and development. Then the intrigue and fast-expanding need for digital security professionals caught his interest. The Facebook partnership sealed his decision to major in Computer and Network Security. "Everybody should jump on it," he said of the opportunity to learn in a Facebook-approved program. "They really want to shape students into desirable job candidates. This is a challenging course, but it's expected to be." Mandal and St. Ambrose are increasing the challenge within the 12-week CodePath course by adding four weeks of academic classwork around it. That includes a final paper and an exam. "We're asking our students to reflect on what they have learned and put it into context of how it fits in the entirety of the computer security realm," Lillis said. "How does it relate to our other courses? How does it relate to other concepts? CodePath is giving us the technical, hands-on training. We are taking it and putting it within the context of the bigger picture." A first-year member of the department, Mandal brings cybersecurity expertise of her own. She has a doctorate in information technology and a master's in cybersecurity from the University of Nebraska-Omaha. She also earned an additional master's in telecommunications engineering from the University of Oklahoma. Her thesis centered on quantum cryptography, an advanced level of encryption that could prove to be cybersecurity's last line of defense against computers built with processors capable of deciphering any classical algorithm-and personal password-in a matter of seconds. Mandal recently received a grant from Dr. Tom and Mary Ann Stoffel to build a five-year research project in the quantum cryptography field, enlisting the assistance of SAU student researchers. That's just one of the ways the Computer and Information Sciences Department is poised to grow. Lillis points to an increasing number of internship partners who give students a taste of the strong employment opportunities the computer sciences offer. "That's why this Facebook partnership can be so good for us-and not just because it's Facebook," he said. "Part of it is helping students recognize that there is something beyond academics here. The computer discipline is growing. We're positioned to grow with it."